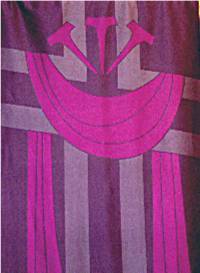 Today’s candle is rose – joyful relief from the penitential purple – signalling that ‘the time’ is near. When the people asked John the Baptist what they should do, he answers simply – act justly, share with those who are hungry, clothe those who have no tunic. May we remember what we mean when we say we want to be a community who offers loving service to the sick, the lonely, the neglected, the ignored, the newcomers, the very young and the very old. "Lectio Divina - Praying the Scriptures in Advent Year "
At first glance, Advent may seem simple enough to understand as a period of preparation for the great Feast of the Lord’s Nativity. But the themes that emerge from the liturgical texts of the Roman Liturgy– the antiphons, collects, readings, psalms, prefaces etc.– present a season that is altogether unique and profound. There is nothing quite like it in the liturgical traditions of the East. Certainly they do have their own special periods of preparation for Christmas and Epiphany but nothing the same as Advent. 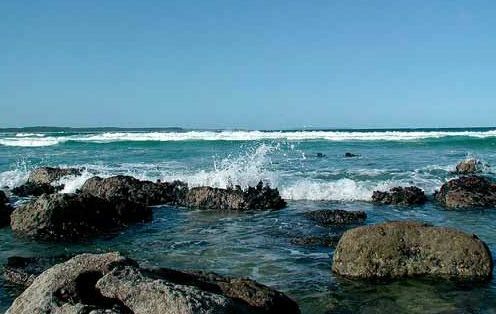 To help us further understand the richness of Advent a Broken Bay Institute booklet has Written by Bishop David Walker DD, with the support of the Australian Catholic Bishops’ Commission for Mission and Faith Formation. "Lectio Divina - Praying the Scriptures in Advent Year "
2nd week – John the Baptist’s challenge: Prepare the way of the Lord! 3rd week – The Messianic Age is here: Therefore, Rejoice! Now that we have become more familiar with the new words, we can probably agree that the changes are quite few. Not so for the priest and the words he prays on our behalf! The Eucharist Prayers – at the heart of the Liturgy of the Eucharist have been the subject of significant changes. Perhaps you have heard some different words without being able to pin down the difference. 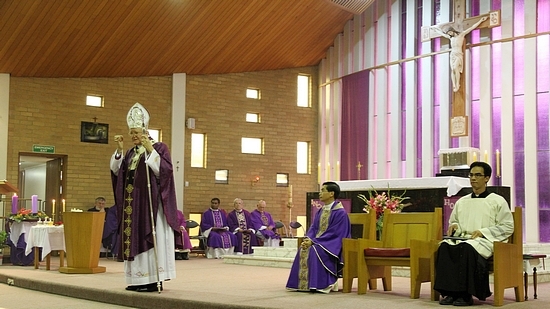 Fr Thang often uses the new version of the First Eucharistic Prayer for Reconciliation. The Parish Liturgy Group meets every Thursday morning from 9 - 10 am to plan prayers, readings and arrangements for Mass and other Sacraments and Services across the three churches in the Parish. The Group warmly welcomes anyone who has an interest in learning more about the word of God and helping to make the words more easily accessible, relevant and helpful to peoples' lives, including young people. 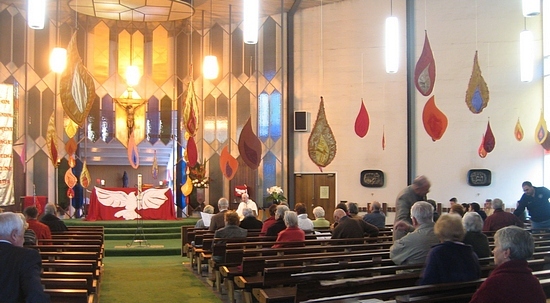 It similarly welcomes enquiries from people potentially willing to assist with some of the Liturgical preparation, being a Reader or helping in other areas of the Mass. 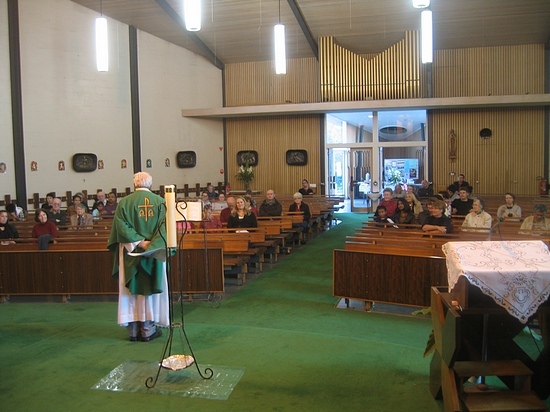 Each church has powerpoint projection facilities and computer operators are also needed. 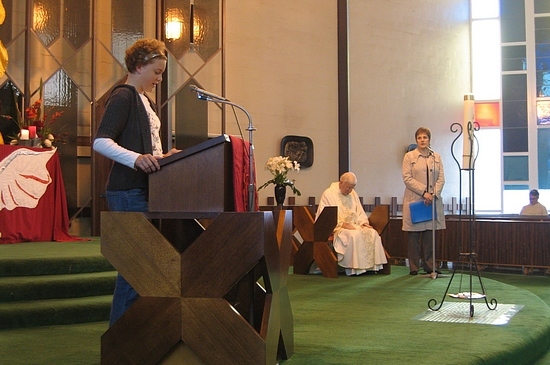 The Liturgy Group can be contacted at cpiliturgy@bigpond.com or via the Parish Office 03 9499 1515. 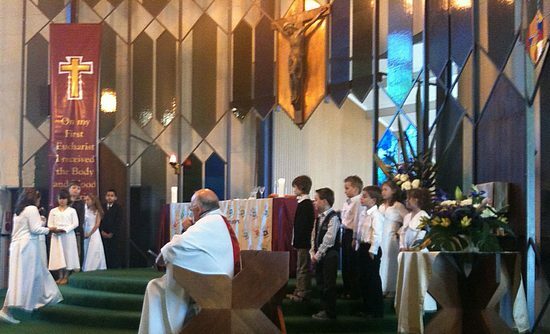 Resources for children are available at Mass at each of the Churches. 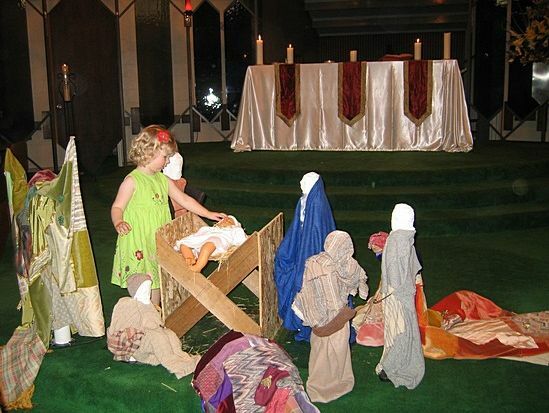 Books, Bibles stories and activities are available for children. Please ask when you arrive at Mass. 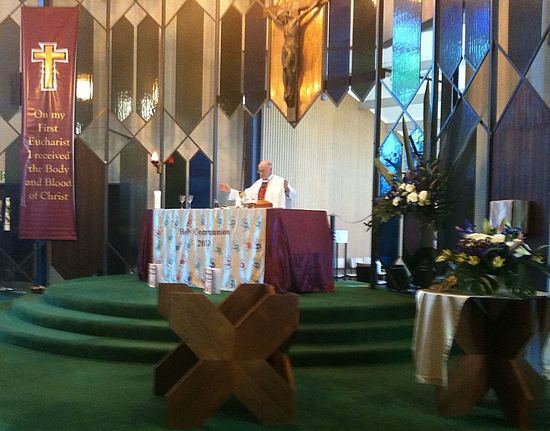 The new translation of the Mass, the Revised Roman Missal, will be phased in during 2011. The actual Mass is not changing – the familiar pattern of the Mass is exactly the same – what is changing is some of the words – the original Latin text has been re-translated to be more accurate. Ivanhoe will be using the revised “People’s Part” – which is not a lot of changes – starting at Pentecost. 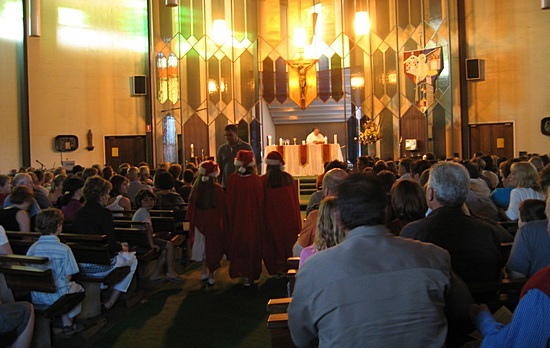 No changes will be used in Ivanhoe Masses before Pentecost. Choir & music rehearsals will start straight after Easter. The Parish schools will start learning the new responses in term 2. - with the Deanery and led by the Archdiocese facilitators – this will be on Saturday morning 26th February 2011. 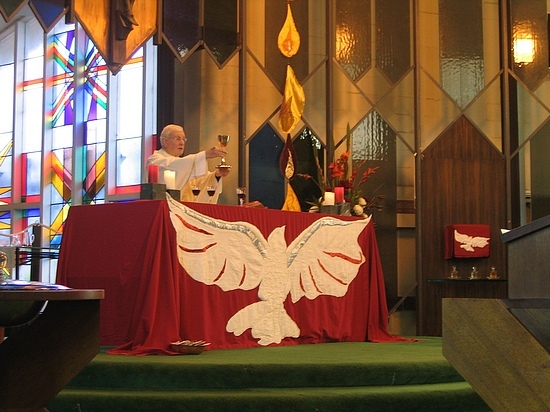 Trinity Sunday celebrates God's presence and action in the world, from the beginning to today. Five pm Mass on Sunday 23rd August 2009 was the first of what might possibly become a more regular pattern of occasional "Experimental Masses" in the Parish at at each of our three Churches in turn. What is experimental is not so much the Mass itself but its more abbreviated form, "interactive Homily", and getting together briefly afterwards for "refreshments, cuppa and chat". Paul’s love for Jesus drove him to use his all his energy to spread the Good News and to persuade/encourage all he encountered to also become disciples. He understood the message of Jesus so clearly that he moved beyond the Jewish people, across the barriers of race and creed – ‘Neither Gentile or Jew’. He used skills that were relevant - speaking to the academics of Athens or the domestic situations elsewhere. Stormy seas and harsh men inflicted suffering on him but he saw it all in the cause of his mission, Eventually, he gave his life - by the sword - in Rome having claimed his right to be tried there as a Roman citizen. He accepted that suffering was an inevitable part of his discipleship. Our lives are very different from the dynamic Paul. It is not likely that we will be ‘put to the sword’ but our discipleship, in this time and this place will have it own cost in the form of disappointments, of being let down or not understood, of weariness, of frustrations. But we can be inspired by him, seeing how he witnessed to God as a God of grace, light and hope and how he believed in the power of the Spirit to energise our lives in Jesus. He would affirm most strongly that this power is available to us now, in Ivanhoe in 2009. Paul’s conversion, that is his ‘turning around’ led him to a totally new way of life. In his own words, “It is no longer I but Christ living in me.” Urged to spread the Good News, he travelled extensively in three great missionary journeys, visiting countries at the Eastern end of the Mediterranean Sea, known to us today as Israel, Syria, Turkey and Greece. He travelled by road and by sea, recording with real directness the dangers, the risks, the sufferings he encountered. He preached to community after community, but didn’t leave it there. He wrote those letters that are so familiar to us, with words of encouragement, responding to their particular needs and, at times, dealing with their doubts and, their disputes. Above all, he wanted every person he met to be formed in the love of Christ, with zeal for the Gospel, offering all hope and new life in the Christ. Around this time last year, Pope Benedict proclaimed a Year of St. Paul to extend from 29th June 2008 until 29th June 2009 as a way of honouring, in a special way; this great apostle. Week after week, we listen to the letters Paul sent to the communities he had established. 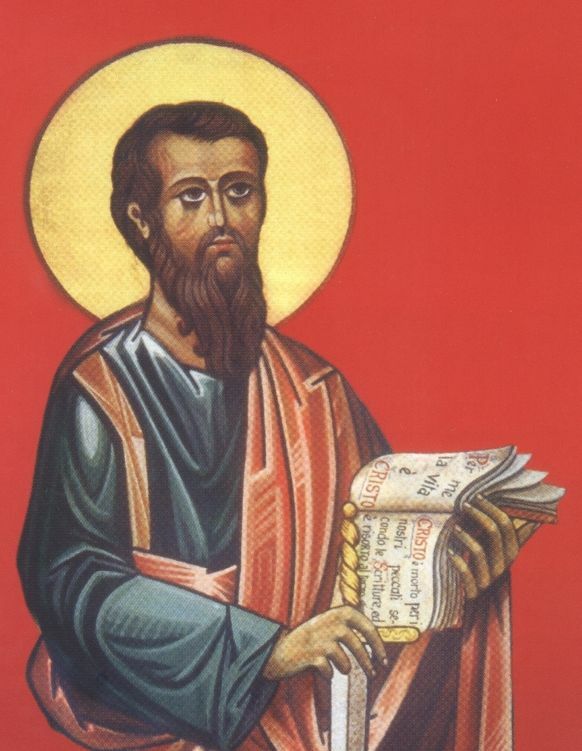 The Liturgy Group thought that June would be a good time to highlight his life and his work by making it a Month of St. Paul. Saul, that dedicated persecutor of the embryonic church - The Way - was a most unlikely person to become a proclaimer of the Good News about Jesus. Armed with authority from the Jewish leaders in Jerusalem, he was on his way to continue the campaign of hate in the northern town of Damascus. Dramatic events overtook him on that journey—a bolt of lightning resulted in blindness and, above all, he experienced a personal encounter with the Jesus whom he persecuted. Saul’s meeting with Jesus changed his life. The ‘new man’, now known as Paul, embraced The Way and the former persecutor became a most committed proclaimer of the Good News. The words ‘Road to Damascus’ took on an enduring new significance. Those with a deeper interest in learning about St Paul may wish to avail themsleves of a free National "eConference" on St Paul at the Yarra Theological Union in Box Hill (details here). During May an implicit theme underlying our Masses was Leadership - and in particular picking up up the baton extended to each of us by Christ (and our Priests in Ivanhoe). In June, the last month of The Year of St Paul, we will consider different aspects of St Paul and his impact on our lives. The comments for this week re-introduce St Paul and provide a few facts on his early life (here). Capacity and over-capacity congregations at Christmas Eve Masses, such as the 7:30pm Family Masses at Mary Immaculate and Mother of God (below). At the stable in Bethlehem. Celebrant Fr Jim Scannell spoke of the involvement of Jesus with the most 'human' and poorest people. He spoke of the need to be able to 'listen' to the word of Jesus. He showed a detail (as held in the picture above) of Michaelangelo's interpretation at the time of the face of Jesus - an image that perhaps differs from our image today. 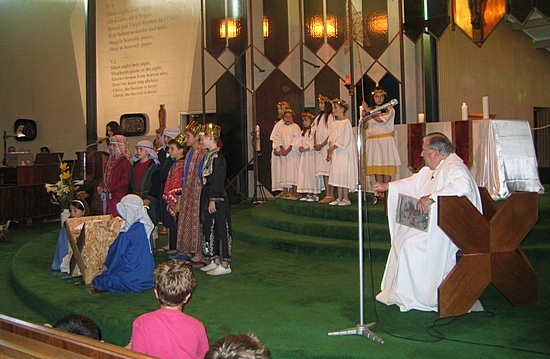 The Gospel reading on the effect of the birth of Jesus enacted by children at Mother of God Church. For Mary it was treasuring and pondering on what had happened. For the shepherds it was going out and telling others the good news. Celebrant was Fr Len. The lighting of the fourth Advent candle. The time is very near – Mary’s time of waiting, and ours, is nearly over. As we light the fourth candle, we remind ourselves that Jesus’ birth is really the beginning of his mission, which is our mission too … to be the presence of the loving God in our world. The lighting of the third Advent candle. Today’s candle is rose - joyful relief from the penitential purple - signalling that the ‘time is near’. Isaiah and John the Baptist continue to challenge us: Prepare a way for the Lord—prepare to be a people who offer loving service to the sick, the lonely, the neglected and ignored, the aged, the very young, the newcomers. The lighting of the second Advent candle. This weekend, we relight the candle that was lit for the first time at the beginning of Advent last week. The lighting of the second candle tells us that we are a little closer to Christmas. As we light this second candle. We hear the voice of John the Baptist, in the Gospel, crying out: ‘Prepare the way of the Lord.’ Do we hear this as a challenge to us to prepare a welcome for those who come into our lives and to offer them the hospitality and acceptance that every human person longs for? Maranatha, Maranatha, Come Lord Jesus come. Pope Pius XI in 1925 instituted the feast of Christ the King in answer to numerous requests from Cardinals, bishops and lay faithful at a time when Christ was being pushed more and more out of the lives of nations, families and individuals. The Pope commented that when the reign of Christ was challenged by anti-clericalism, or secularism, it was opportune to institute a feast of the kingship of Christ (more). Last week, when the first volume of the "Opera Omnia" of Joseph Ratzinger was presented at the Vatican, one question naturally arose: why is it that the first volume printed, of the sixteen planned, is focused on the liturgy? It is entitled the "Theology of the Liturgy" and the Pope asked that it be printed first for a reason (read more). "On Thursday 8th May we went to meet the Liturgy team to discuss the readings for Mass on Sunday. When the team asked us what we thought about Mass and what we would like to change, they listened to our suggestions and comments with appreciation. We learned lots about how the Mass is organised and how many meetings the organisers go to so that they can make the readings easier to understand. They invited us to go to the youth group when we are at the end of year 6 which made us feel really special. The parish leadership team invited Mareesa, as the liturgy leader for MIPPS, to help with Children’s liturgy on the first Sunday of the month. They were very friendly and we learned a lot about the Mass. They were happy to listen to what we had to say so that they can help young people feel more a part of the Parish community and feel more enthusiastic about coming to Mass. We really enjoyed being able to be heard without being judged and we thought it was very kind of them to give us lollies as well! "